Metabolic syndrome is a group of risk factors that includes high blood sugar, high blood pressure, high cholesterol, and abdominal fat. In the U.S., more than 40% of people older than 50 are known to suffer from metabolic syndrome. The problems are similar to those who are obese. When combined, these symptoms can increase the risk of heart disease, strokes, heart attacks, and diabetes. A new randomized, double-blind, crossover study published in the American Journal of Clinical Nutrition suggests that obese people with metabolic syndrome require more than normal levels of vitamin E since weight problems can cause higher levels of oxidative stress. At the same time, obesity and other problems associated with metabolic syndrome can reduce the effectiveness of vitamin E.
In theory, since vitamin E is a fat-soluble vitamin, it should be available in higher levels in overweight individuals who consume large amounts of fatty foods. 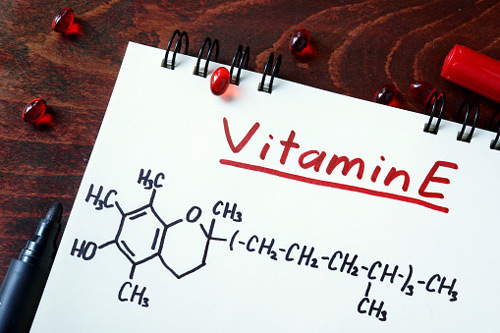 However, researchers at the Linus Pauling Institute at Oregon State University (OSU) found that although there may be high levels of vitamin E in the bloodstream, the key nutrient is still not finding its way where it is needed in obese individuals. Study results led the researchers to consider the possibility that chronic vitamin E deficiency could lead to a variety of diseases linked with metabolic syndrome, such as diabetes, heart disease, cancer, and Alzheimer’s disease. It is important for people to eat food with a little fat when taking a fat-soluble vitamin like vitamin E or it wouldn’t be absorbed otherwise. For the study, 10 metabolic syndrome patients or healthy individuals took 15 milligrams of a vitamin E supplement called alpha-tocopherol with 240 milliliters of either non-fat, reduced-fat, or whole-fat milk before blood was collected after 72 hours. “Vitamin E is associated with lipids, or the fats found in the blood, but it’s mostly just a micronutrient that’s going along for the ride,” explained study author Maret Traber, a principle researcher in the Linus Pauling Institute and a professor at the College of Public Health and Human Science at OSU. Vitamin E and other antioxidants are natural defenses against metabolic stress. In the U.S., over 92% eat a diet deficient in vitamin E. The best dietary sources of vitamin E include extra virgin olive oil, olives, almonds, sunflower seeds, bell peppers, Brussels sprouts, broccoli, and dark green leafy vegetables like Swiss chard, spinach, kale, and collard greens. The researchers also noted that it is a concern that people trying to lose weight reduce their fat intake. The strategy may make sense from a calorie reduction perspective; however, fat is also commonly associated with dietary vitamin E. As a result, the weight loss approach can worsen nutrient deficiencies like vitamin E.
The authors conclude that higher dietary vitamin E is required in adults with metabolic syndrome. The researchers recommend eating a balanced diet with vegetables, and taking a multivitamin daily with 15 milligrams of vitamin E, which is the recommended dietary allowance from the Institute of Medicine at the National Academy of Sciences. Other studies support antioxidant-rich foods and supplements that contain vitamin E as part of a lifestyle to manage obesity and diabetes. Mah, E., et al., “a-Tocopherol bioavailability is lower in adults with metabolic syndrome regardless of dairy fat co-ingestion: a randomized, double-blind, cross-over trial,” American Journal of Clinical Nutrition 2015; 102(5): 1070, doi: 10.3945/ajcn.115.118570. “Obese people need more vitamin E, but actually get less,” Oregon State University web site, November 2, 2015; http://oregonstate.edu/ua/ncs/archives/2015/nov/obese-people-need-more-vitamin-e-actually-get-less. Mateljan, G., The World’s Healthiest Foods: Essential Guide for the healthiest way of eating (Seattle: George Mateljan Foundation), 798–790. Youdim, A., “Metabolic Syndrome,” Merck Manual Professional Version web site; http://www.merckmanuals.com/professional/nutritional-disorders/obesity-and-the-metabolic-syndrome/metabolic-syndrome, last accessed November 3, 2015. Abdali, D., et al., “How effective are antioxidant supplements in obesity and diabetes?” Medical Principles in Practice 2015; 24(3): 201–215, doi: 10.1159/000375305. “What Is Metabolic Syndrome?” WebMD web site, http://www.webmd.com/heart/metabolic-syndrome/metabolic-syndrome-what-is-it, last accessed November 3, 2015.